Ana and I planned out much of our travels in Burma around the ability to meet up with friends in the country and based on timing issues, we had four extra days and needed to stick close to Yangon, Burma’s capital city. 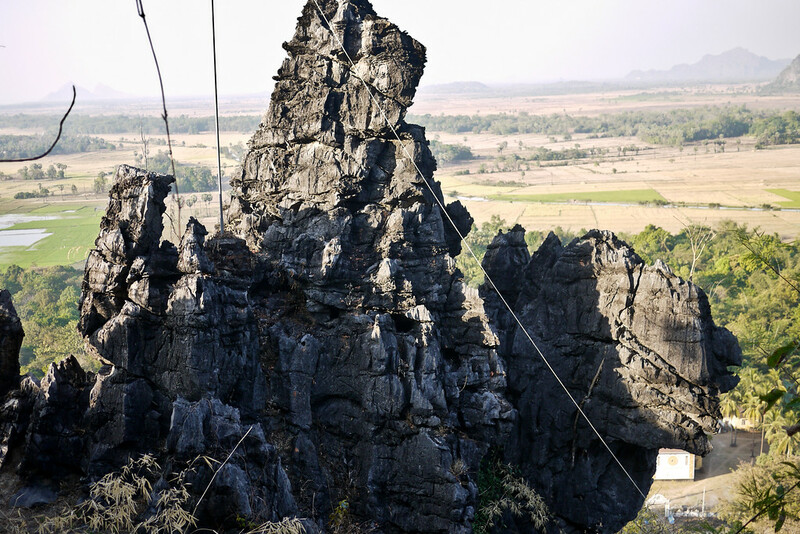 Based on the recommendation of fellow travelers, Ana and I pointed our noses toward Hpa-an, a small and sleepy town about seven hours southwest of Yangon (Rangoon for those who prefer the alternate spelling). 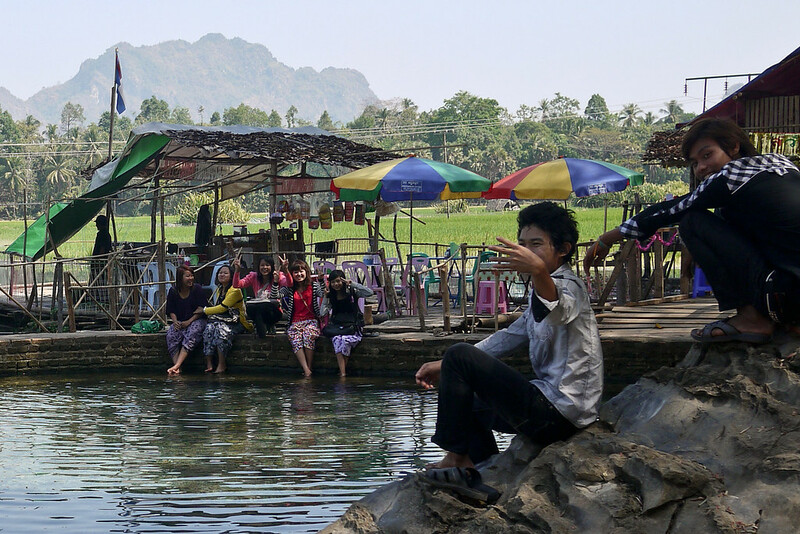 Hpa-An hit on each of my anticipations: small, rural, markets, people and countryside hikes. I wish I could write this post with a sentiment that shouts out “wow, look at this place, it’s amazing, it’s wonderful, awe-inspiring you’ll be jealous I’m here!” That would sell people on the town and probably convince a few people to steer their backpacks and wheelie suitcases in that direction. 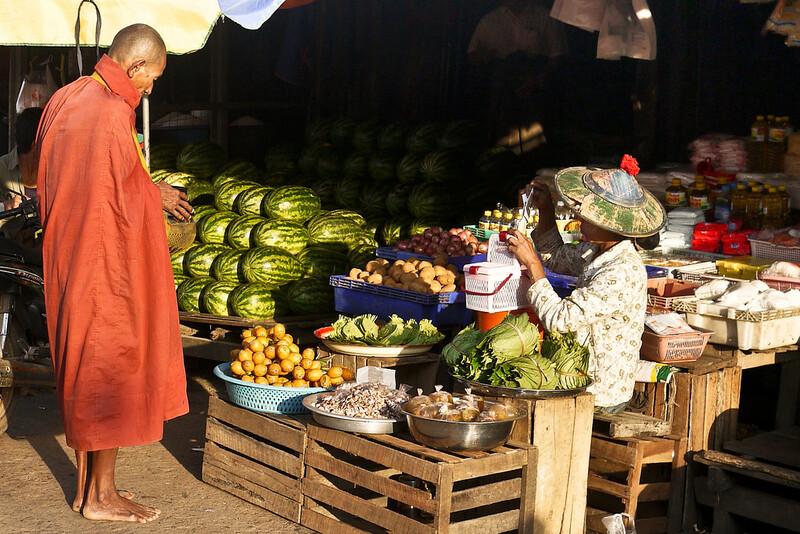 A monk takes alms in the early morning sunshine at the market in Hpa-An, Burma. And I do often visit places with the “wow-factor.” Saying adieu to the temples of Bagan at sunset, sitting on a soft green lawn as the Taj Mahal changed colors in the sunlight, breathing deeply the scent of dense forest around Tikal’s Mayan ruins…these are all such locations. My hike through the Annapurna range in Nepal was feat I had long dreamed about and if I had a bucket-list,that would have been high on it. But the tiny town of Hpa-An, Burma? Well, I can’t sell you on it as an adventure junkie location, and this petite town may never find its way into a travel brochure. Instead, the town is sweet and light; it’s a place with friendly faces and days spent chatting with Ana on long hikes through rice paddies and painted caves. 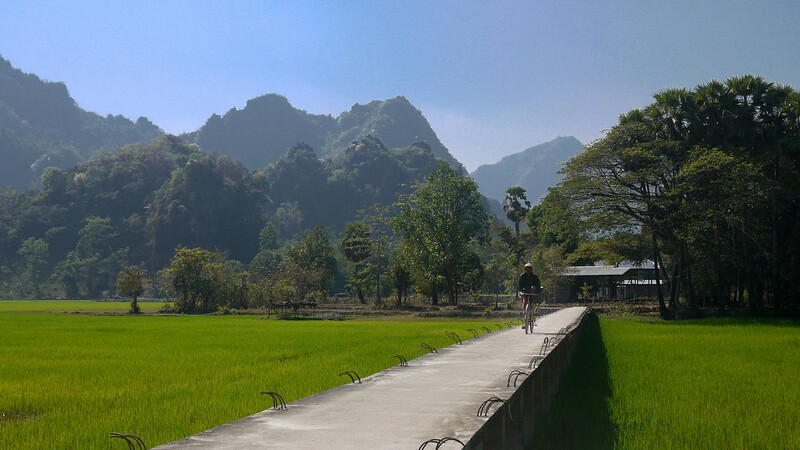 A beautiful bridge through the rice paddies and karst rocks links several rural villages outside of Hpa-An. Small towns are windows into a country’s soul; this is the case in every country I’ve ever visited, my own included. People are more accessible in small towns, it’s easy to walk through the tiny neighborhoods, the cadence of life slows down and locals have the time and inclination for a friendly wave, even a spot of conversation if they speak English. Mornings are my personal time when I travel with my niece Ana. I spend time reflecting, writing, and planning, usually over a quiet coffee. 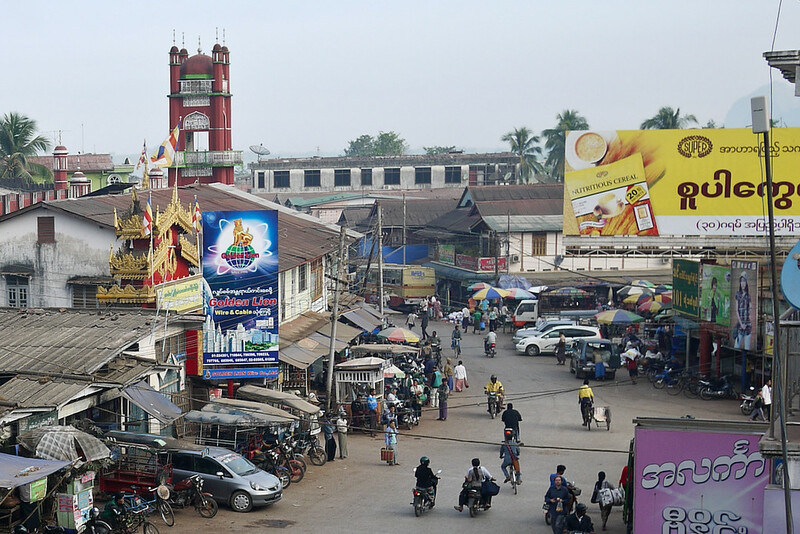 In Hpa-An, with no internet in the hotel (sometimes that is a real blessing), and a hankering for fresh coffee (as opposed to the instant variety offered freely in the hotel), I headed out at sunrise to visit the busy morning market visible out the window of my guesthouse. 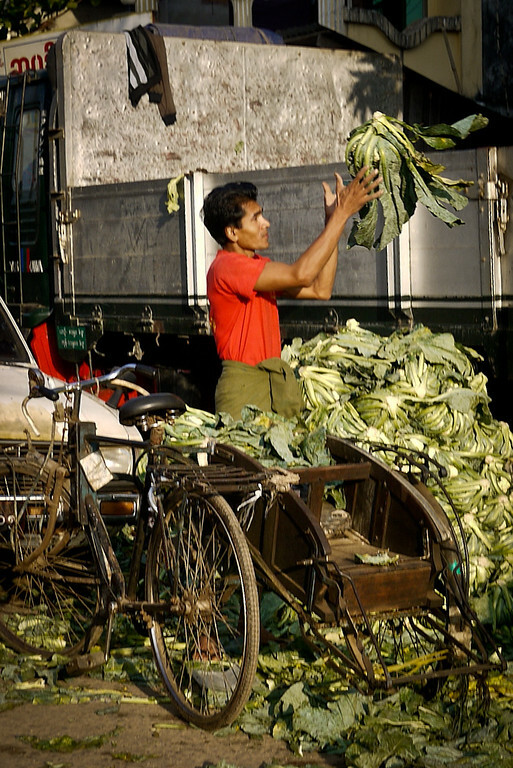 These men loaded their truck from an even more densely packed truck, they stuffed it to the gills with veggies and they will now likely be transported to more rural areas for re-sale. Morning air is fresher than any other time in the day. The nighttime breezes clear out the scents and sounds. Sunrise wipes the slate clean and shoppers and vendors at the dawn market in Hpa-An buzzed with delighted chatter. Locals truck, bicycle, and walk in fresh vegetables from the countryside and by dawn the veggies and fruits are stacked and ready for purchase. Women wield their cleavers and freshly dice up the day’s meat supply for the town. And being the lone tourist around, a grin split my face while juicy fresh watermelon dripped from my hand as I watched the locals in Hpa-An greet the morning with smiles, enthusiasm, and the rhythms of long-established routine that plays out like an exquisitely timed ballet. 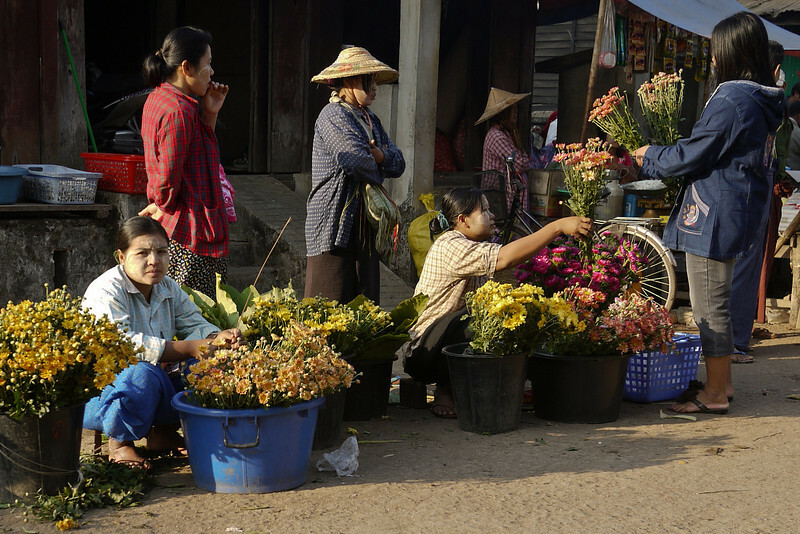 Flower vendors chit-chat amiably on the streets of the early morning market in Hpa-An, Burma. The town of Hpa-An, Burma from the balcony at the Soe Brothers Guesthouse, looking out toward the market. 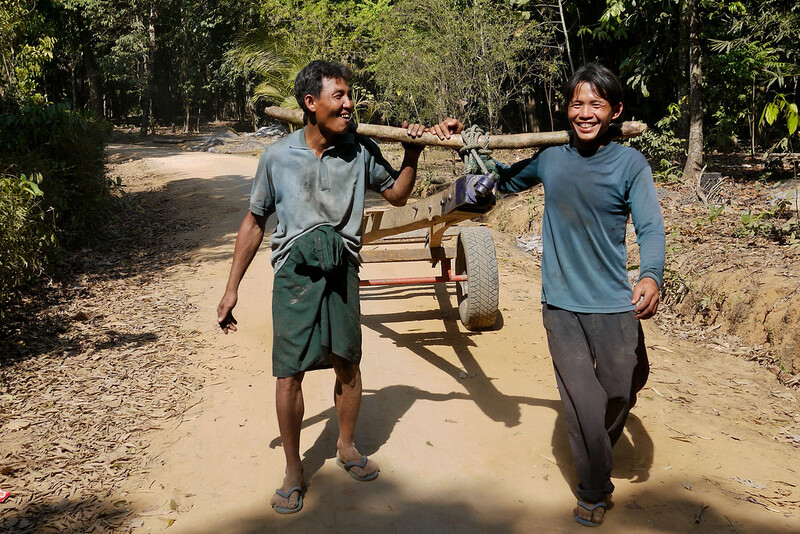 Hours later, one of the helpful owners of the Soe Brothers Guesthouse dropped Ana and me off at a wooden hut plopped near a field deep in the countryside with a grinning old woman selling bits and bots of soda and snacks to anyone making a pilgrimage to the cave shrines. He gave us clear instructions on getting back to town, a good call on his part because for the rest of the day, the only clear English we spoke was to each other! With a jaunty wave and a “see ya later,” Ana and I were left with a hand-drawn map in our hands showing a path through rice paddies to various caves and temples awash with paintings and Buddha statues, and a nearby swimming hole popular with the locals. I handed the reins over to Ana; at 11 she’s quite old enough to lead us around our map to the various spots and it’s more fun for her if she has some control, particularly on a day of exploring paths, caves, temples, nooks, and crannies. 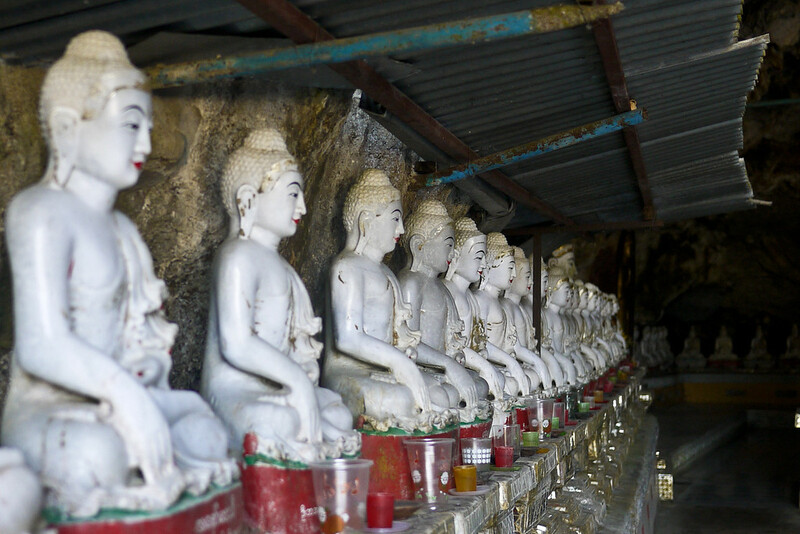 Buddha statues in the Kawkathaung Cave near Hpa-An, Burma on a daytrip from the Soe Brothers guesthouse. 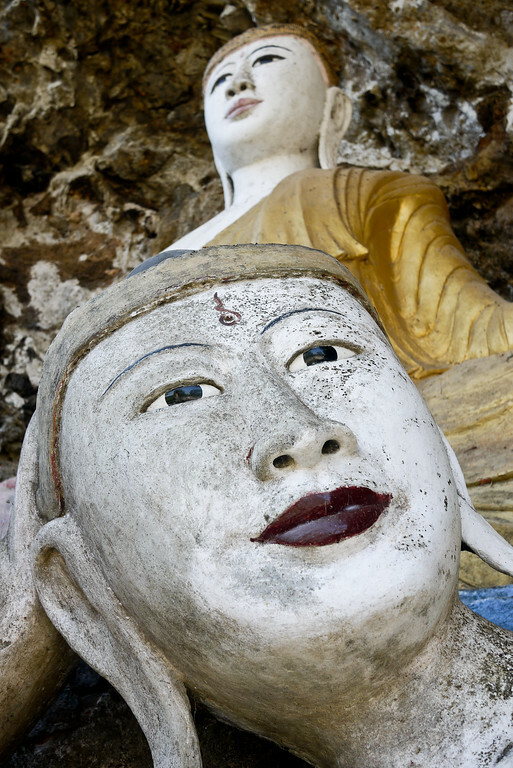 Dozens and dozens of monk statues line the rocks outside the Kaw Ka Taung Cave in Hpa-An, Burma. 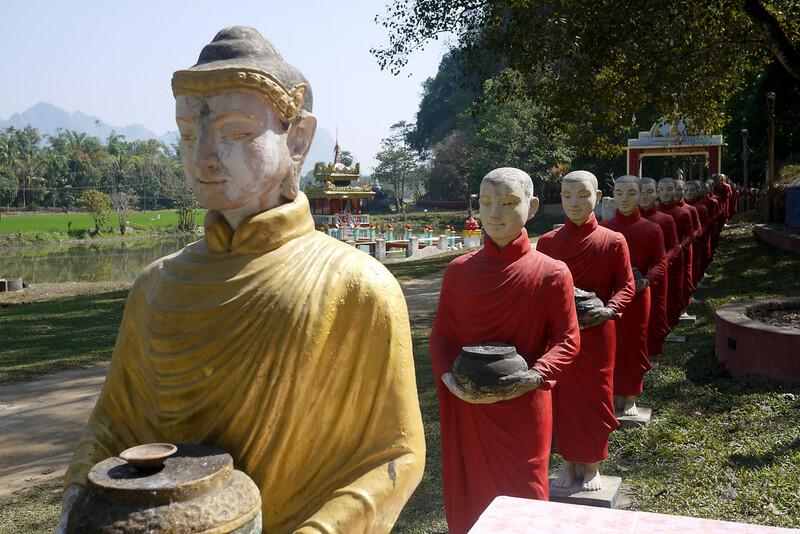 We found the Kawkathaung and Ruby caves filled to overflowing with Buddhas. Paintings and signs carved into the rock. Small statues filled naturally formed rock crevices. We found a small artificial pool of clear water diverted from the surrounding rice paddies, and floating restaurants popular with local teens who arrived three to a motor-bike and they flowed into the inlet with the giggling enthusiasm, jostling and joking common to just about any gathering of 16 to 20 year-olds the world over. We opted to dip our feet instead of swimming because we would have had to swim fully clothed… and not because I forgot to pack swimsuits, but rather because jumping around in a western-style bathing suit would have prompted jaws dropping, uncomfortable stares and basically would have been a great big taboo in modest Myanmar. Local women swim in their longyi skirts and maintain a lot of skin coverage! And by sitting on the edge with some of the teens, they were able to pepper us with questions spoken in an enthusiastic version of English, augmented with charades, and the ensuing antics as we attempted to communicate left us all in giggles. Local teenagers wave goodbye to us after some cheerful conversation at the swimming hole near the caves. Ana tests out the cool waters at the swimming hole near Hpa-An, Burma. Beautiful expanses of bridges panned the flooded rice paddies, and huge grins split the faces of locals when as we got ourselves lost in the small dirt streets weaving through villages. 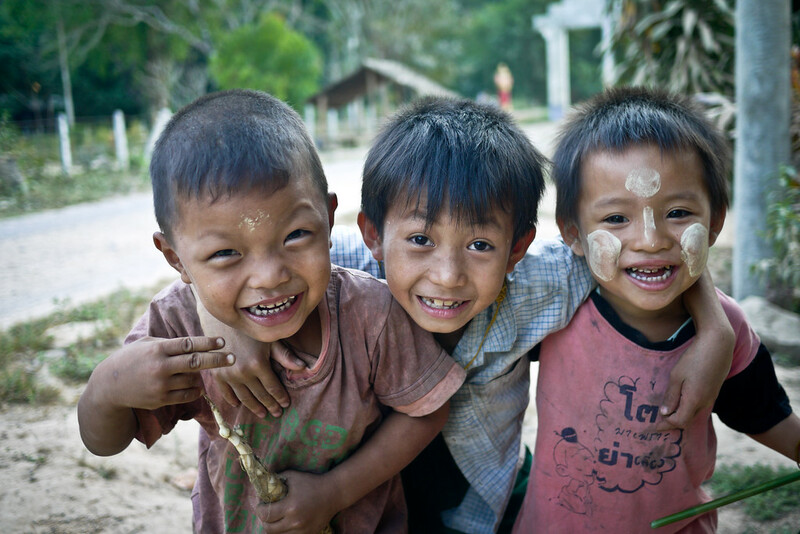 Hearty greetings as we wandered the very rural countryside in Hpa-An, Burma. These children made my day! They were so sweet and enthusiastic in pointing us onward through the path, while posing and hamming it up at the same time! As the day ended, Ana spied a staircase near the wooden hut that began our adventures. Like modern-day explorers, she set off with enthusiasm and a breakneck pace up the winding stone staircase. At the top, we looked out from a crumbling temple. We sat and chatted about our day, our plans, and life as we watched late afternoon sunlight spill over the hills and valleys around Hpa-An. For Ana, I thought maybe she would be disappointed by the slow pace and small adventures. She surprised me though, because she felt the day was a win all around because she was able to 1) sleep in, 2) help plan/navigate throughout the day, 3) see some things without time pressures and rushing, and 4) she was back to the hotel early enough to read her book (she was reading the first Hunger Games book and, understandably, addicted). Some days, we’d wake up early, have a full day of sightseeing, other days of marathon 12 hour bus rides. So, I get it. 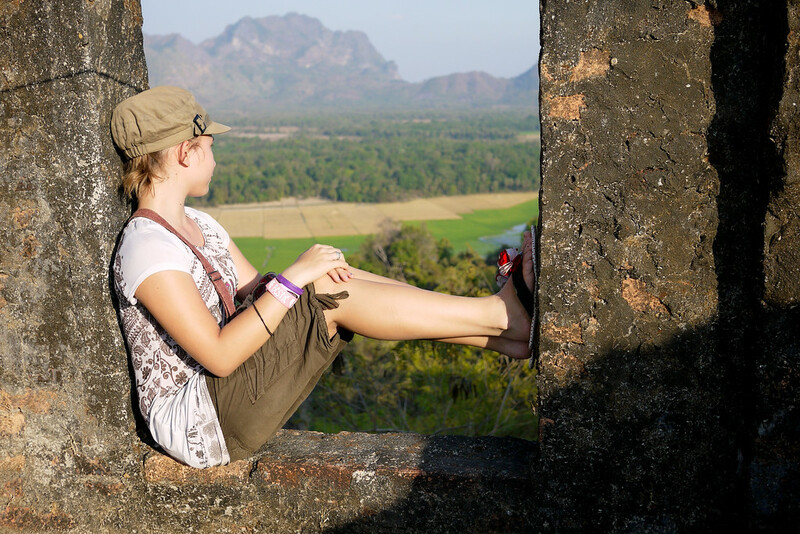 She wanted a casual day, with some sightseeing but framed by downtime and sleep, and Hpa-An was the perfect spot for all of these things. 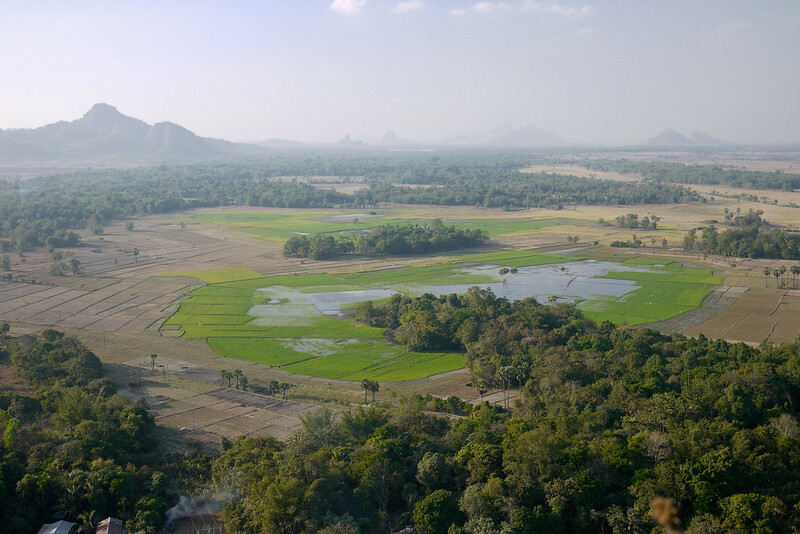 Looking toward Mount Zwegabin and the countryside around Hpa-An. Ana looks out over the rice paddies and villages we spent the day wandering. So, without a lot of fanfare we walked back down those well-worn stone steps, followed the dirt path back to the main road, and hailed a passing truck willing to drop us in town. It’s not the most remarkable of days. But it stands out in my memory for its simplicity. The company couldn’t have been better, and it’s one of those days I really only discovered once I slowed down and savored cadence of life in each new town. Where to stay: Hpa-An is about five hours south of Yangon, and budget travelers can’t go wrong with the Soe Brothers Guesthouse (it’s one of the few guesthouses in town, so it was easy to get dropped directly here!). If you’re looking for something budget but a bit nicer, opt for Thanlwin Pyar Guest House. 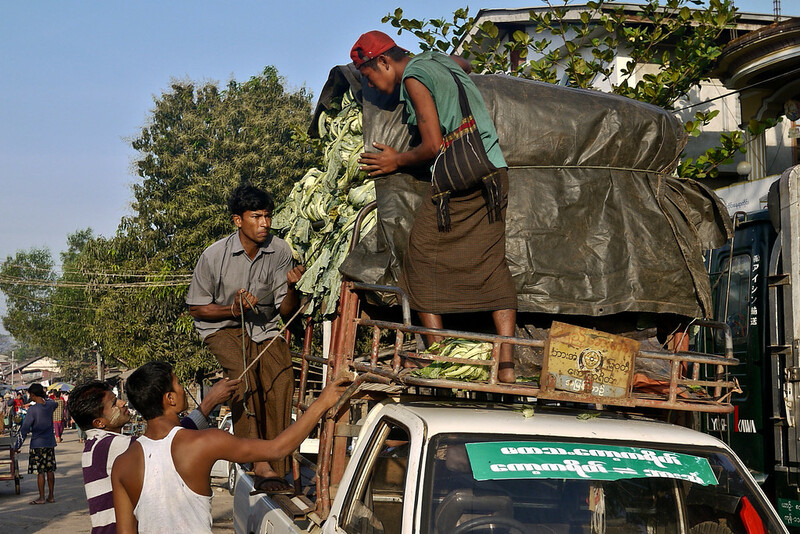 How to get to Hpa-An: Buses run to Hpa-An from Yangon (perhaps seven hours on a good day), to get to Kyaiktiyo, the Golden Rock, you ride in the back of a truck for a very optimistic five to seven hours. I’ve heard lovely things about the boat to and from Mawlamyine. What to do: Book your tours through the Soe Brothers Guesthouse. They speak great English and can organize tours to Mount Zwegabin, any of the surrounding caves, and everything there is to do in town. Even if you stay at the mid-range hotel 10k outside of town, book your activities through Soe Brothers. The morning market is great and a great place to grab a street-food breakfast if you eat meat (vegetarians are better off at the restaurant/shop just near the Soe Brothers). What to read: I used the Lonely Planet Myanmar throughout our month in the country and it was, at times, the only way I could figure out English language information on logistics. If you plan to explore off-the-path, having a guidebook is invaluable when figuring out whether a train, bus, or pickup truck is your best transport option. You should also bring one of the fascinating books about Myanmar to read as you travel there—it will lend you insight into the culture and people. I recommend The River of Lost Footsteps: Histories of Burma and Finding George Orwell in Burma—each on offers a different but needed perspective on such a contradictory country. A free rundown of everything I learned from years backpacking Southeast Asia, and a beginners guide of sorts for anyone traveling through Thailand, Laos, Vietnam, Myanmar, and Cambodia! Nice pics… I just spent 4 months in se asia, I missed Myanmar though, I hear the Burmese are some of the friendliest ppl in Asia. I had heard about Burma but never visited there. I was not even knowing that it is a nice adventurous place. I think you have enjoyed your trip a lot. Thanks for sharing it with us. Adventure is in my blood. 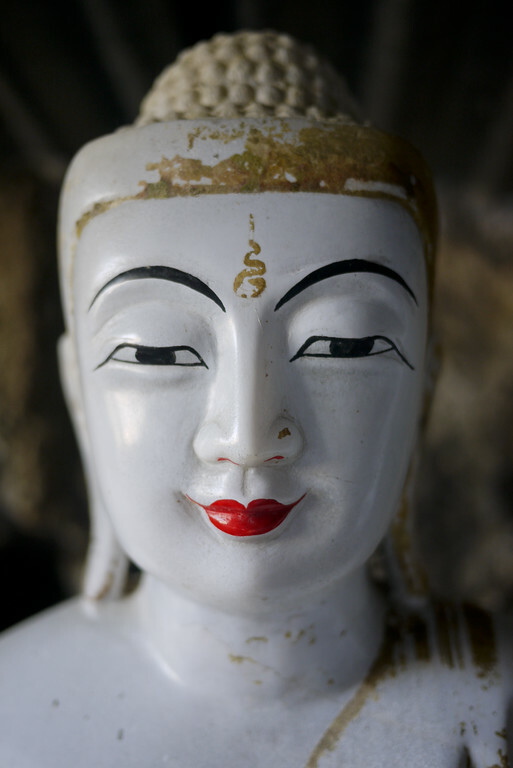 I like historical places and I am inspired from Buddha. 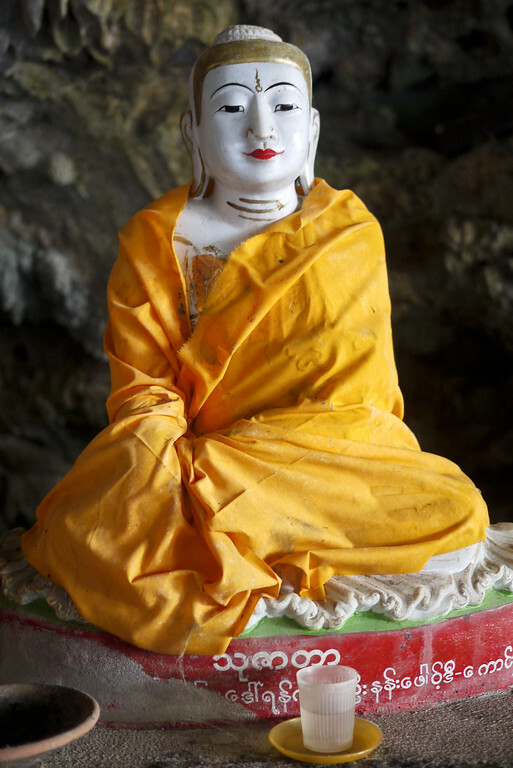 Unfortunately I have not visited Burma, but after reading your post I feel that I have been there. Thanks for sharing. 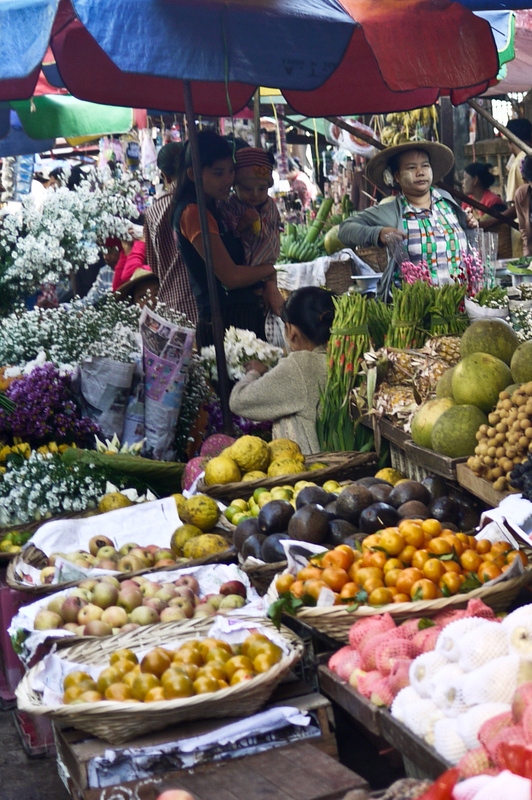 Sounds like you found a great way to spend a few days near Yangon. Will have to add this to the itinerary for Burma! This is my first visit to your blog, Shannon! So glad to find you. Love your storytelling English! Signing up for your updates :) Thanks for a beautiful introduction to Hpa-an. Yes, you have convinced me to steer a backpack in that direction ;) Will read through your blog and tuneup for your updates. The photos are great! Say hi to Ana! Like Spencer said; I’ve heard good reports on Burma as well, but have never run across any of my travel-friends who have been there. And you know; maybe you’ve covered this in previous blog posts, but I’ve always wanted to ask you…what safety/security steps do you take to research a country/area before you travel there? We’ve all read those stories about hikers/travelers who accidentally crossed into the wrong country, etc. I think they even made a movie about Burma being one of those a few years ago. I was just curious because while you pick sights to visit that aren’t always the norm, you must be doing research because you have had little trouble on your adventures. Wow, woefully late response from me, sorry! Thanks for weighing in….Burma was a very specific choice because I knew a handful of travelers who had done it, I had Western friends living in the country, and that sort of thing — so I knew that although there are international tensions, and plenty of conflict regions on the borders, tourism is actually very, very safe if you go the “tourist” route and fly into the country (which is really the only legal way into Burma, people cross over the borders, but those are the conflict zones and they technically should not). I hear alot of good reports about Burma. Might have to put it on my travel wishlist if your photos are anything to go by. It’s a beautiful country to visit, and if you are willing to give up some control because of the weak tourism infrastructure, it can be wonderful! Beautiful photos Shannon! Alas, we didn’t make it to Hpa-An nor Kyaiktio during our visit. An excuse to return! Hope all is well back home. I awoke to the news on the radio this morning, talking about an Australian Diplomat visiting the Burmese opposition leader, and thought, “I wonder if A Little Adrift are still in Burma”. Then here was your post! I can’t see anything but the camel now too–what a great observation!